Python programming has various frameworks and features to expand in web application development, graphical user interfaces, data analysis, data visualization, etc. Python programming language might not be an ideal choice for web application development, but is extensively used by many organizations for evaluating large datasets, for data visualization, for running data analysis or prototyping. Python programming language is gaining traction amongst users for data science whilst being outmoded as a web programming language. 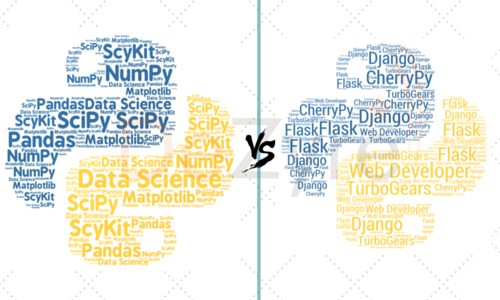 The idea of this blog post is to provide a comparison on the two completely different purposes of using Python language and help understand that it is not necessary to know Python as a web programming language for doing data science in Python. Organizations of all sizes and industries – from the top financial institutions to the smallest big data start-ups are using Python programming language to run their business. 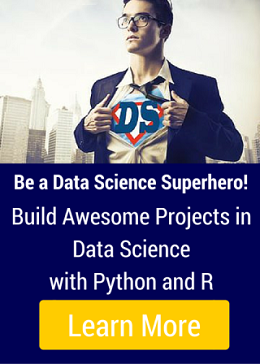 Enrol for Python Data Science Course to learn how you can join them! Python language is among the popular data science programming languages not only with the top big data companies but also with the tech start up crowd. Python language ranks among the top 10 programming languages to learn in 2015. “There are only two kinds of languages: the ones people complain about and the ones nobody uses.” – Bjarne Stroustrup. Python language comes in the former category and is finding increased adoption in numerical computations, machine learning and several data science applications. Python language can do anything, excluding performance dependent and low level stuff. The best bet to use Python programming language is for data analysis and statistical computations. Learning Python programming for web development requires programmers to master various web frameworks like Django that can help the build websites whereas learning Python for data science requires data scientists to learn the usage of regular expressions, get working with the scientific libraries and master the data visualization concepts. With completely different purposes, programmers or professionals who are not knowledgeable about web programming concepts with Python language can easily go ahead and pursue data science in Python programming language without any difficulty. Python is a 23-year-old powerful expressive dynamic programming language where a programmer can write the code once and execute it without using a separate compiler for the purpose. Python in web development supports various programming paradigms such as structured programming, functional programming and object oriented programming. Python language code can be easily embedded into various existing web application that require a programming interface. However, Python language is a preeminent choice for academic, research and scientific applications which need faster execution and precise mathematical calculations. Python web programming requires programmers to learn about the various python web development frameworks, which can be intimidating because the documentation available for the python web development frameworks might be somewhat difficult to understand. However, it is undeniable that to develop a dynamic website or a web application using Python language, learning a web framework is essential. Django is the python web development framework for perfectionists with deadlines. Python web development with django is best suited for developing database driven web applications with attractive features like automatic admin interface and a templating system. For web development projects that don’t require extensive features, Django may be an overkill because of its confusing file system and strict directory structure. Some companies that are using python web development with django are The New York Times, Instagram, and Pinterest. It is a simple and lightweight solution for beginners who want to get started with developing single-page web applications. 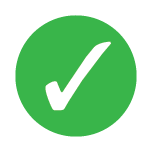 This framework does not support for validation, data abstraction layer and many other components that various other frameworks include. It is not a full stack framework and is used only in the development of small websites. It emphasizes on Pythonic conventions so that programmers can build web applications just the way they would do it using object oriented Python programming. CherryPy is the base template for other popular full stack frameworks like TurboBears and Web2py. There are so many other web frameworks like Pyramid, Bottle, and Pylons etc. but regardless of the fact, whichever web framework a python programmer uses, the challenge is that he/she needs to pay close attention to detailing on the tutorials and documentation. Why Web Development with Python is an impractical choice? Python for web development requires non-standard and expensive hosting particularly when programmers use popular python web frameworks for building websites. With PHP language being so expedient for web programming, most of the users are not interested in investing in Python programming language for web development. Python language for web development is not a commonly demanded skill unlike demand for other web development languages like PHP, Java or Ruby on Rails. Python for Data science is gaining traction and is the most sought after skill companies are looking for in data scientists, with its increased adoption in machine learning and various other data science applications. Python for web development has come a long way but it does not have a steep learning curve as compared to other web programming languages like PHP. Why Python for Data Science is the best fit? Why data scientists love doing data science in Python language? 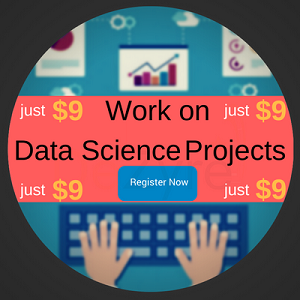 Data Scientists like to work in a programming environment that can quickly prototype by helping them jot down their ideas and models easily. They like to get their stuff done by analysing huge datasets to draw conclusions. Python programming is the most versatile and capable all-rounder for data science applications as it helps data scientists do all this productively by taking optimal minimal time for coding, debugging, executing and getting the results. The real value of a great enterprise data scientist is to use various data visualizations that can help communicate the data patterns and predictions to various stakeholders of the business effectively, otherwise it is just a zero-sum game. Python has almost every aspect of scientific computing with high computational intensity which makes it a supreme choice for programming across different data science applications, as programmers can do all the development and analysis in one language. Python for data science links between various units of a business and provides a direct medium for data sharing and processing language. Python has a unified design philosophy that focuses on ease of use, readability and easy learning curve for data science. Python has high scalability and is much faster when compared to other languages like Stata, Matlab. There are more and more data visualization libraries and cool application programming interfaces being added for inclusion of graphics to depict the results of data analysis. 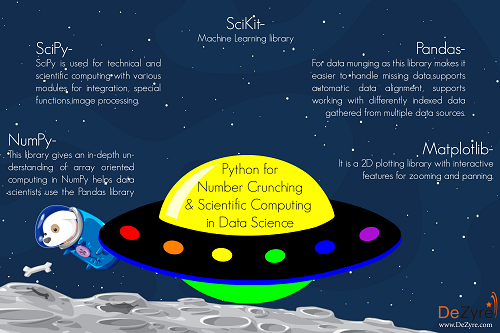 Python has a large community with good number of data science or data analytics libraries like Sci-Kit learn, NumPy, Pandas, and Statsmodels, SciPy etc. which have rich functionality and have been tested extensively. Data analysis libraries in Python language are growing over time. It is the foundation base for the higher level tools built in Python programming language. This library cannot be used for high level data analysis but in-depth understanding of array oriented computing in NumPy helps data scientists use the Pandas library effectively. SciPy is used for technical and scientific computing with various modules for integration, special functions, image processing, interpolation, linear algebra, optimizations, ODE solvers and various other tasks. This library is used to work with NumPy arrays with various efficient numerical routines. This is the best library for doing data munging as this library makes it easier to handle missing data, supports automatic data alignment, supports working with differently indexed data gathered from multiple data sources. 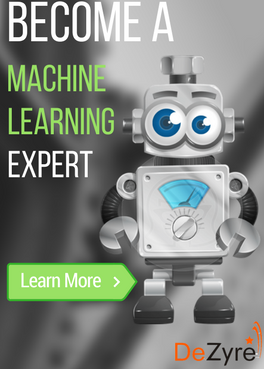 This is a popular machine learning library with various regression, classification and clustering algorithms with support for gradient boosting, vector machines, naïve Bayes, and logistic regression. This library is designed to interoperate with NumPy and SciPy. It is a 2D plotting library with interactive features for zooming and panning for publication quality figures in different hard copy formats and in interactive environments across various platforms. Matplotlib, NumPy and SciPy are the base for scientific computing. There are many other Python libraries such as Pattern for web mining, NLTK for natural language processing, Theano for deep learning, Scrappy for web scraping, IPython, Statsmodels, Mlpy and more. For people starting with data science in Python, they need to be well-versed with the above mentioned top data analysis libraries in Python. If you are a data scientist who uses Python language, we would love to voice your opinion in the comments! On which points above do you agree or disagree? What are some important considerations that we have left out for doing data science in Python?